JFAUK follows contest rules established by the World Judo Federation European Technical Committee. To download the JFAUK contest rules, please click on the image on the left. The Contest Rules approved and ratified by the WJF European Technical Committee were first published on February 1, 2013. 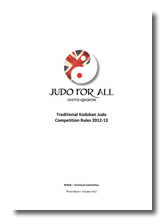 It is formally entitled: “Traditional Kodokan Judo Competition Rules”. To download the WJF EU contest rules, please click on the image on the left. The WJF European Technical Committee was established at the behest of the WJF President for Europe, Dr P Hogland, with a mission to put together common ideas and formally produce the contest rules for WJF that conform and are in line with its mission statement. The present document successfully outlines a well thought-out and detailed set of contest rules that uphold all the values and concepts of traditional Kodokan Judo as perceived by its founder Dr Jigoro Kano. It charts a practical way to promote the concept of Judo For All, which is embedded in the document. It devises a distinct course of action for the growth and wider participation of the public in judo that is based on the experience of judo practitioners and teachers. This new document was produced by the WJF European Technical Committee who chose to produce it in consultation and with the authority and expertise of 19 masters that include 2 grandmasters, and 16 instructors ranking from 3rd to 9th Dan. It is an authoritative document that is the product of views and experiences of masters from 3 European countries and many clubs and associations. 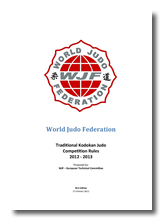 This document carries that authority and the wisdom of some of the highest and most experienced ranks in the WJF and is in complete accordance with the concepts and mission statements of the World Judo Federation.